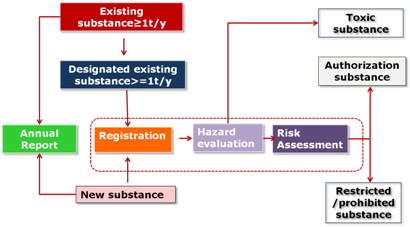 On the first of July, South Korea Ministry of Environment (MOE), officially published their first "Existing Chemical Substances Subject to Registration" (Priority Existing Chemicals(PEC)) List in accordance with Article 9 of the Act on Registration and Evaluation of Chemical Substances (K-REACH). 1"A Priority Existing Chemical (PEC) is an industrial chemical that has been identified as requiring an assessment because there are reasonable grounds for believing that manufacturing, handling, storing, using or disposing of the chemical could be a risk to health and/or the environment." The list published by South Korea contains 510 substances. Any person who intends to manufacture or import these substances greater or equal to one tonne (1,000 kg) per year will be required to register prior to manufacturing or importing that substance. The current list of PEC substances must be registered by June 30th 2018. There will be a second list of PEC substances that is expected to be announced in 2018. Contact TCA today to arrange a evaluation of your products!